USE these Lesson Plan Template and Lesson Plan Template Guide in order to assist you in developing your lesson for the Hunts Point Slave Burial Ground (HPSBG) Project. The “Lesson Plan Template” should be utilized for writing up your lesson(s) in order to maintain consistency across all collaborating teachers. Lessons should utilize materials from the Hunts Point Slave Burial Ground (HPSBG) Project. ​Check out available hard copy resources in the PS 48 Hunts Point Slave Burial Ground Learning Center. 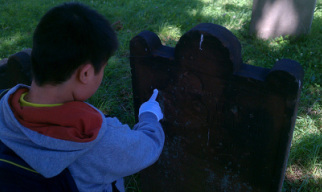 Students investigate those buried in Drake Park. Students devise a research plan for Drake Cemetery.